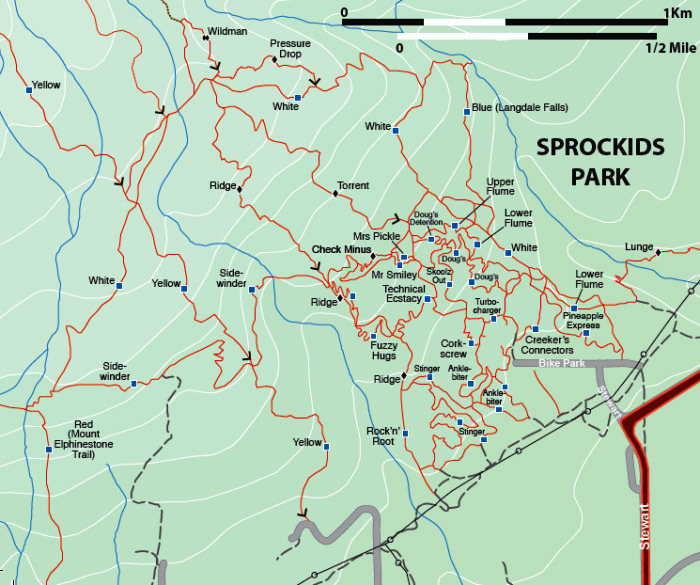 This Sprockids trail map shows over 14 km (8.4 mi) of trails many of which include jumps, steep downhill, teeter-bars and ramps. Most of the biking routes loop back to the park centre where there is a skills area. This park is on the side of a mountain so a lot of the trails are very steep. Getting up them is often difficult on your bike, but coming down is the payoff. If you are hiking you can expect some difficult climbs and the downhills are tough on your knees, but the scenery and surroundings are simply beautiful and well worth the hard work. Several trails near the outside of the park link into Gibsons and Roberts Creek trails. It is possible to start hiking or biking in the park or even in Langdale and by following trails and the odd logging road get all the way to Sechelt without riding on a paved road. Once you make your way through Sechelt you can get back on the trails and ride all the way to Egmont Road (almost Earls Cove) without having to ride on a paved highway. Click on the map below to see a list of the trails and their descriptions. Click here to return from the Sprockids Map to the Sprockids Bike Park. Click here to return from Sprockids Trail Map to the Sunshine Coast Trails Home page.